COMMUNITY SERIES #7C: COUNT US IN, MAHER, JOSH, AND SAHILL! 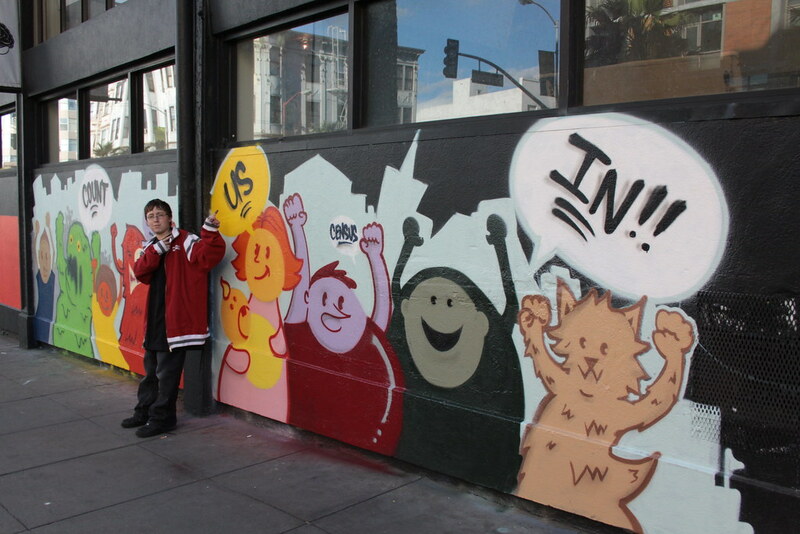 We are pleased to announce that our kids were featured in the SF Chronicle on Sunday for the mural they submitted to Yo! Youth Outlook’s US Census 2010 contest. We just handed Josh a copy of the paper and he can’t stop grinning from ear to ear saying “OooOOo!”. It was really hard for us to keep this a secret from them but we wanted to maintain an element of surprise. Maher’s principal may have let the cat out of the bag when she mentioned something about it… We’ll see what he has to say after he gets out of school today. 1) What does the census mean to you? The census is something that tallies up how many people there are in an area and finds out how many resources are needed there. 2) What materials did you use to create the mural? 3) Did you have help with this mural? What did you use to create it? 4) What inspired this work? 6) Who are the people in the mural? The human in the mural are people that are participating. The monsters are the people who society looks down on, but they are still important, so we should count them. Congrats, Maher, Josh and Sahill! Keep on creating and being positive! « ADD SOME DEFENESTRATION TO YOUR LIFE!